Kidzworld saw Bohemian Rhapsody, the story of the band Queen and its talented lead singer Freddie Mercury. Will it rock you? 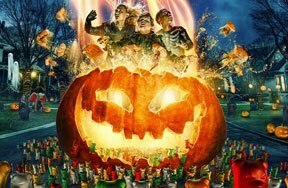 Read our movie review! Bohemian Rhapsody starts in the 1970’s and tells the story of Freddie Mercury (Rami Malek) who was born Farrokh Bulsara, a British Parsi (descendants of Persians). He’s a college student and baggage handler at Heathrow Airport when he joins a pub-playing band called Smile, turns them into Queen and becomes their talented frontman/lead singer and songwriter. Queen rises to fame with original songs, many written or inspired by Freddie. 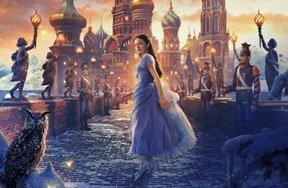 Fame doesn’t mean a happy personal life for the Queen star who is miserable as he questions his sexuality and the woman he calls the “love of his life”. Freddie, who doesn’t really fit in with his conservative family, goes to a nightclub to watch a local band called Smile. 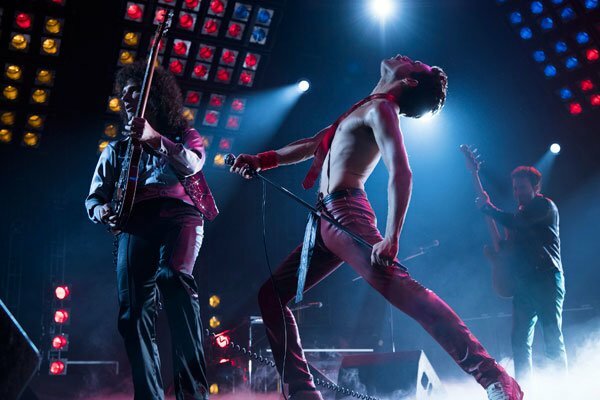 After the show, he meets guitarist Brian May (Gwilym Lee) and drummer Roger Taylor (Ben Hardy) and offers to be the band's new lead vocalist after bassist/vocalist Tim Staffell quits. 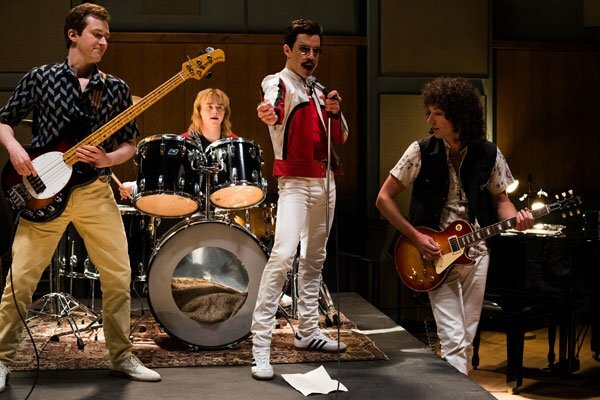 With the addition of bassist John Deacon (Joseph Mazzello), the band, now known as Queen, plays local gigs across England until they sell their van to produce their debut album. Freddie has met music fan Mary Austin (Lucy Boynton) and thinks he is in love. 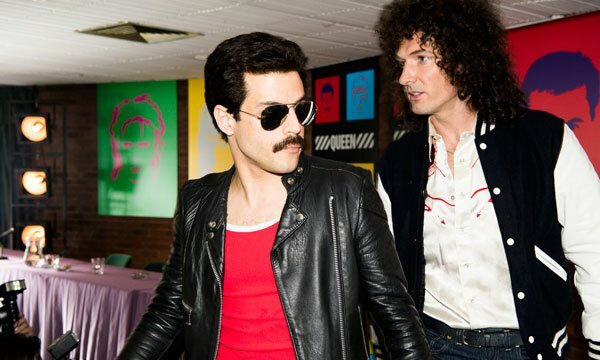 Queen’s unique musical style lands them a contract with EMI Records and big-time producer Ray Foster (Mike Myers). During the band's U.S. tour, Freddie begins to question his sexuality. 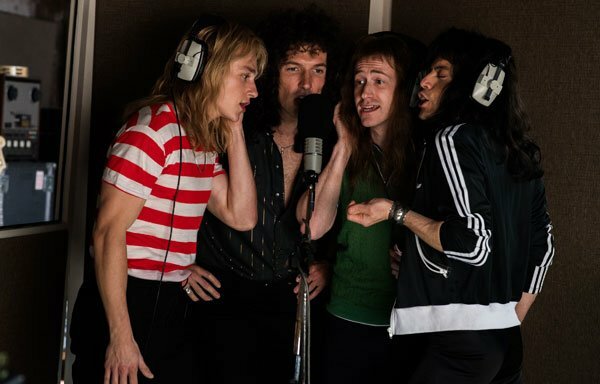 In 1975, Queen records their “A Night at the Opera” album, but they walk out on Ray Foster when he refuses to have the six-minute song "Bohemian Rhapsody" released as the album's first single. Freddie has Capital Radio DJ Kenny Everett debut the song on the airwaves. Despite mixed reviews, "Bohemian Rhapsody" becomes a massive hit. Shortly after Freddie gives Mary an engagement ring, the couple breaks up when he reveals to her that he is bisexual. He also forms a shaky relationship with Paul Prenter (Allen Leech), the band's second manager. Into the 1980’s the band’s success grows but the members fight over their “sound”. Feeling lost, Freddie has a party at his house, ticks off the band members who leave. Alone, he falls for sweet waiter Jim Hutton ( Aaron McCusker) who tells him to get back in touch when he really figures out who he is. In 1982, the band’s press conference to promote new album “Hot Space” is turned into a witch hunt when reporters press Freddie with personal questions. He needs a break so “goes solo” for multi-millions, seemingly ending his relationship with Queen. Freddie moves to Munich in 1984 to work on his first solo album and gets swept up in lavish gay lifestyle parties with Prenter despite remaining friends with ex-love Mary. 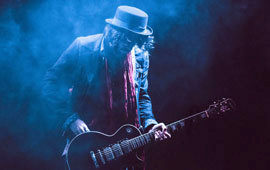 One night, a pregnant Mary pays him a visit and urges him to return to the band, since they have been offered a spot in Bob Geldof's huge Live Aid concert at Wembley Stadium to help those starving in Africa. Upon discovering that Prenter withheld information on Live Aid and Mary’s many attempts to contact him, Freddie kicks him out of his life. In response, Prenter goes public about Freddie's sexual escapades. With the 1980’s outbreak of the AIDS virus spreading worldwide, Freddie secretly has himself medically checked and discovers that he has the disease. Realizing that the band is like his family, he returns to London to ask for their forgiveness. they reconcile and are given a last-minute slot in Live Aid. He reunites with Hutton and practices his dad’s saying "Good thoughts, good words, good deeds,". He and his dad reconcile when dad learns he has AIDS. Prior to the show, Freddie reveals his disease to his band mates and Queen's amazing Live Aid performance is a success, helping increase the rate of donations during the event. In a credits sequence we are told that after Freddie's death from AIDS in 1991 at age 45, band manager and the remaining members of Queen created the Mercury Phoenix Trust to help combat the spread of AIDS worldwide. 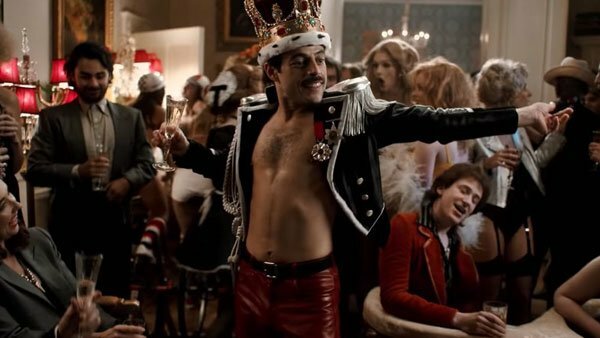 Rami Malek’s performance as Freddie Mercury is nothing short of phenomenal. Even if you aren’t familiar with Freddie or even the band Queen, you will know many of their songs, “We Are the Champions”, “We Will Rock You”, “Somebody to Love” and so many more amazing and unique hits. My screening audience was made up of over 3/4ths teens and young people who weren’t alive when Queen was playing but they know and love the songs. The reenactment of Queen’s amazing, final Live Aid Concert will blow you away. The audience clapped at the end of the film. You may or may not identify with some of Freddie’s problems; acceptance by family, questioning sexual identity or the pressure that comes with success but Rami Malek’s performance will make you care about him. The film isn’t an in depth look at the rise of the band, fights they had etc. In fact it follows the same formula most movies about bands do (rise to fame, arguments, break ups, etc.) 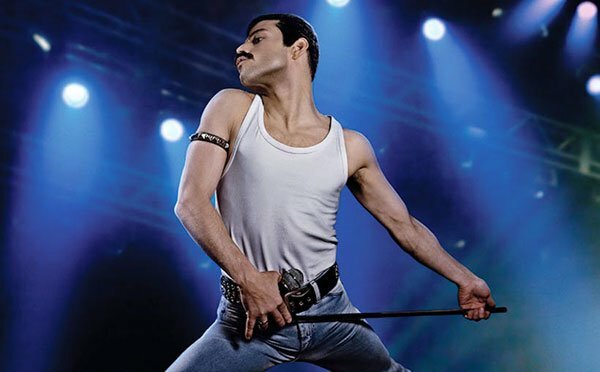 It more centers on ultra-talented Freddie’s personal struggles and, in that, it is a success. 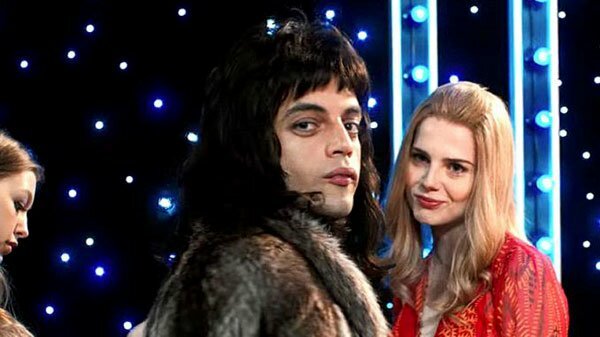 You will laugh at Freddie’s sheer “out there” will to take chances and maybe shed a tear at his vulnerability and sad end. Prepare to stomp and clap, because the movie will “rock you”. We go four stars. See Bohemian Rhapsody in theaters now! Are you familiar with the music of Queen? Can you identify with the famous singer’s personal problems or do you have a good friend who can? Share your thoughts with other Kidzworld visitors with a comment or express yourself on your profile page! Best Part of Being a Rock Star? Rocking out for a crowd! Traveling the world on tour.